Our last day in Europe was back in England. As I mentioned previously, a scheduling error had us back in the UK a day earlier than necessary. We had planned to travel back to London the night before our flight back to San Francisco, but I got the dates mixed up and we ended up getting tickets a day earlier. In light of this, we decided to travel from Paris to London, transfer in London, then take the train about 90 minutes out to the countryside to visit the town of Bath, and hopefully tour Stonehenge. Bath is a pretty unique little village in the hills of Somerset and is one of the oldest settlements in England. During the waning days of the Roman empire, Roman settlements reached far into England; including Bath, one of the oldest. Over 2,000 years ago, the Romans came upon the many natural mineral springs in the Bath area and established the Roman baths, the remains of which still exist today. The original Roman baths are no longer in use due to safety and sanitation concerns, but visitors still flock to the area to get a taste of the English countryside and enjoy the many convalescent spas. Bath is a big tourist attraction, largely I suppose to its easy proximity to London and its ancient roots. The Roman Baths are probably the top draw, but the narrow windy streets and hillside stone buildings are also a draw. Modern Bath looks like a mall or any high street in Europe, dotted with familiar chain stores, a few Starbucks and a McDonald's (yes, there's even a Gap there). Many feel that Bath has lost its soul, but its still a pretty town and worth a visit. You can tour the Roman Baths in about an hour, and the tour is accompanied by an informative audio tour. A little Roman Bath goes a long way, however. So I wouldn't recommend to listening to every audio track or seeing every exhibit. We stayed about an hour or so and went off to find lunch. That afternoon we had set aside to take a bus tour from Bath to see the ancient triptychs of Stonehenge. The tour we had hoped to take was booked full and the next one wasn't until the following day, when we were to be on a plane back to San Francisco. We went to get a cup of coffee and decided to come back to the tour operator in case of a no-show. Turns out one couple that had registered didn't show up, but another young man was already waiting standby. He claimed to have submitted a request the night prior, as I did as well. The simple fact was that if he goes, one seat would be empty. If we go, the bus would be full. Simple economics prevailed and we boarded the bus for Stonehenge, and he stormed off miffed at being trumped by capitalism. 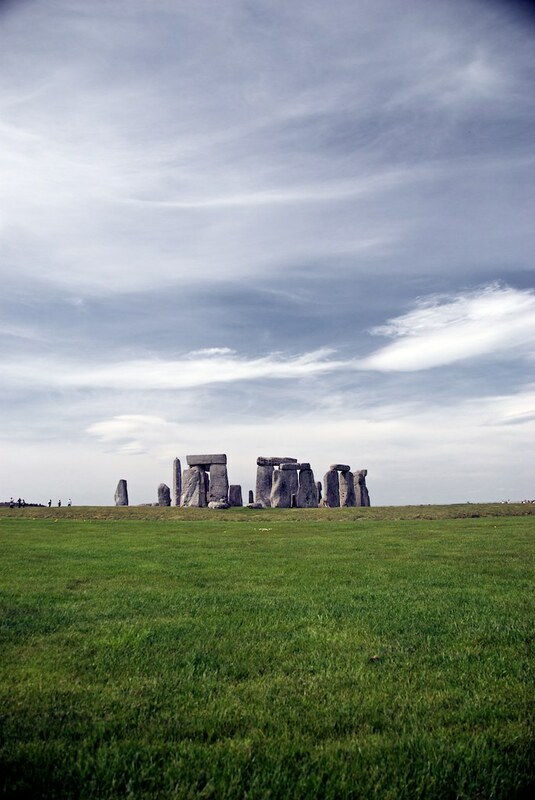 The ride to Stonehenge is about an hour through the rolling hills of the English countryside. The ride was quite nice. Everyone we had spoken to had done a good job of dramatically lowering expectations for Stonehenge, so by the time we saw it was adequately impressive. Many in England are puzzled by foreigners' fascination with Stonehenge. I was pretty insistent on adding this to our tour as I seemed to have heard and read so much about it growing up. I found it to be worthwhile. Visiting Stonehenge today is a pretty orderly affair. You buy a ticket, are handed an audio tour device, and circle the monument slowly listening to the history and facts about the stones. Up until a few years ago you could climb on the rocks, stand beneath them or even until about 10 years ago, rent a hammer and bang off a souvenir to take home. In 1918, the Royal Air Force petitioned the government (twice) to knock down the stones as they interfered with flight training. Today the stones are afforded the respect deserved as a 5,000 year old astrological monument of unknown origin or use. In today's tour configuration, the crowds are kept at a distance which allows for better picture taking yet you're still able to appreciate the stones. I have to admit that I can't talk about Stonehenge without mentioning Spinal Tap. If you haven't seen the movie, its an ingenious mock-documentary about a fictional 80's heavy metal group from England. There's a very memorable sequence where the hapless band asks their tour manager to construct a replica of the monument to accompany their on-stage performance of their rock-tribute to Stonehenge. A slight misunderstanding during the replica's construction leads to a pretty hilarious performance. The clip is about 4 minutes long but well worth it. Update: There used to be a clip of that famous scene embedded herein, but it appears the copyright holder as removed the video from YouTube and I don't know where else to find it. Do rent the movie; that scene alone is worth it. After Stonehenge, we stopped on our return at the village of Lacock, a quinteseential English town that has remained largely unchanged in the past 400 years. Because of its historic and iconic look, its the set of many movies including most of the Harry Potter films. Another interesting fact about Lacock is that the world's first ever photographic negative was exposed here, snapping a picture of the abbey's window. Why here and why that window, I'm not sure. We stopped at the George Pub for a pint of the 6X (strong stuff) before our snooze-filled ride back to Bath. We boarded the train back to London around 5:30, and the ride was about an hour. We stayed that night at the Hilton attached to Paddington Station for an easy commute to Heathrow the next day. Taht night we ate dinner at Wagamama, the popular chain of Asian-fusion cuisine. We ate at Wagamama the day we arrived so it was a fitting bookend. We ended the night shutting down one of the more popular pubs in Notting Hill before heading back to the hotel on the last underground train of the evening. Two weeks flew by, as did the dollars I'm sure. I haven't yet received my Visa bill as I'm sure they're still printing it as I write this. In the past 10 years, I've learned to get more enjoyment out of experiences than stuff, which may come as a surprise to those who've seen how much stuff I have. But, I'd rather spend my last dollar on travel and experiences than other material pursuits. I'm back in the US for a while, at least until August. Until then, happy trails.